This entry was posted on June 3, 2013. Bookmark the permalink. who’s description ofMuni just about sums it up: “It’s like a moving psychiatric ward,” he said. The 22: A bus that is forever a clusterf*ck. Packed to the max, I often wonder if there is such a thing as a ‘bus capacity’, like elevator capacity, because I’m pretty sure the 22 would violate it each and every minute of the day. Traversing the city from the collar-popped, bleach-blond, posh Marina through the beats of the Fillmore to the buzz (or chaos) of 16th and Mission and ending in the barren Dogpatch, the 22 picks up all sorts of characters that, when packed tightly together like sardines, continually provides me with silly stories to share. 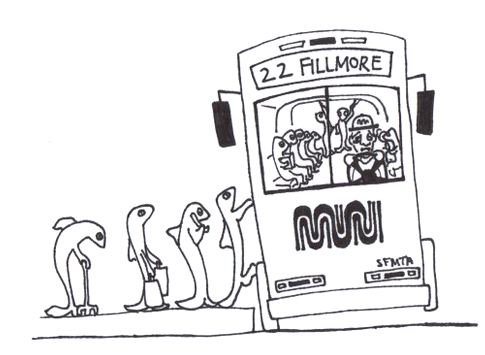 As an ode to Muni, I’d like to share my two favorite stories from the 22. So today was no different. Yes, I scored a free ride, but then had to jam up next to all sorts of characters. Sometimes it’s not so bad, but when one of your fellow sardines is a very drunk and very smelly man with a bad and nonsensical attitude, that’s when the irritation begins…. but also the hilarity. Stunned, everyone just looked at him confused. The door was only lightly touching him—how could it possibly elicit such drama and pain? Finally the words of advice penetrated his drunken fog and he stepped up one step. The door closed and the bus took off. The man stepped back down to the first step. The bus stopped at the next stop and the same thing happened again. People were pissed, especially since this time as the man cried out in desperation, chunks of spit were flying everywhere. By that point I had found myself a seat, so I missed the sprays of spit—barely. As the screaming continued, and was finally resolved once the man stepped up one more step, I couldn’t help but giggle, uncontrollably, which made the girl across from me laugh uncontrollably, which then spread like a yawn to the neighboring seats. The unnecessary theatrical display of the situation was just so ridiculous. Along the 22’s route, just before it heads up over the hills to enter Pac Heights, there seems to be a stop quite popular with the old folks—and by old I mean 80+. The only reason why I really began to notice this trend is because the naive Courtney used to sit at the front of the bus, mostly since it would be empty when I would get on at the bus’s very first stop. But then I would soon get bumped to the back as senior citizens piled on (the front seats are given priority to the disabled and old). So on this bus journey the trend was no different—old people piled on, and I moved to the back. Within the next few stops the bus was packed, and I was now wedged into a seat in the second half of the bus. Once we began the descent into Lower Pac Heights, an old woman in the front rang the bell for the next stop. Due to the intensity of the bus’s carrying load and age of the woman, her departure was a process. People poured off the bus to make way for this woman, who was sitting in the very first seat on the bus. Once the runway was clear, she slowly stood up, hunched over her cane, and hobbled ever so slowly to the ‘landing dock’ of the bus. Once on the dock, the bus driver extended the dock out over the curb with the intentions of lowering it to the ground so that the old woman could smoothly de-bus. (It’s the same mechanism used for wheelchairs). However the old woman seemed to be confused, and was using the landing dock as more of a plank. As the dock moved out from the bus, so did the woman—she just kept on hobbling, seriously approaching the very edge of the dock. While this may not sound funny, it actually was slightly humorous, mostly because it was a commotion in slow-motion and no one could believe it was actually happening. The woman was walking so so so slowly. As the yells continued, people in the back of the bus all looked at each other confused with the expression, ‘Is this really happening?’ One person even mouthed ‘O-M-F-G’ as he pressed his face against the window in disbelief. The woman finally stopped at the very edge of the plank and was lowered down safely to the curb. The outside passengers helped her off as the rest of us applauded the gallant efforts of the bus driver and passengers who helped.